Bò bía is a Vietnamese jicama and carrot spring roll that is traditional, refreshing and a healthy Vietnamese appetizer or snack. 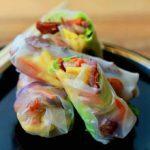 Bo bia is a lesser known variant of the famous gỏi cuốn (Vietnamese summer roll, or fresh roll). It is a similar concept but with different fillings. Bo bia is the Vietnamese name for popiah which is eaten in China, Taiwan, Singapore, Malaysia and Thailand. It is a roll or wrap of wheat flour with a stuffing of yam, bean, jicama, carrots, omelet and lap xuong sausages (Chinese sausage). 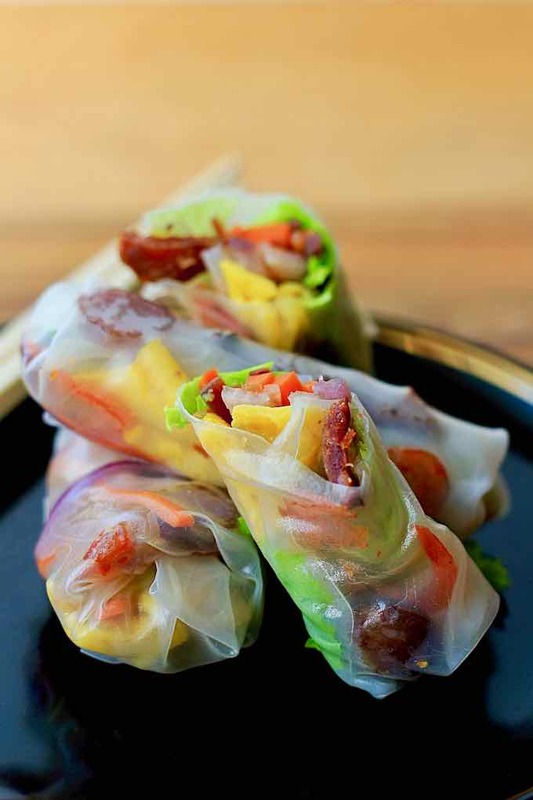 The Vietnamese have given a twist to this dish by using Vietnamese rice paper. Rice paper is one of the best inventions of Vietnamese cuisine. 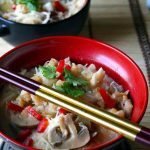 It is common to stir-fry the sausage, jicama and dried shrimps separately, but you can add them together for convenience. Using garlic and/or onion to taste and Thai basil can be supplemented or replaced by lettuce. There are two types of spring rolls in Vietnam. The first type is fried spring rolls (cha nem or cha gio) and the second one is fresh spring rolls (nem or goi cuon) which don’t require frying. 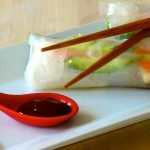 You may come across the second type with other names such as summer rolls or rice paper rolls. Vietnamese fresh spring rolls with jicama and egg (bo bia) belong to the second group. In Vietnam, bo bia spring rolls are often eaten as a snack. They are especially popular with young students because street food vendors love selling these right outside the school gate. They contain crunchy vegetables, soft egg strips, flavorful sausage and shrimp, and aromatic herbs. 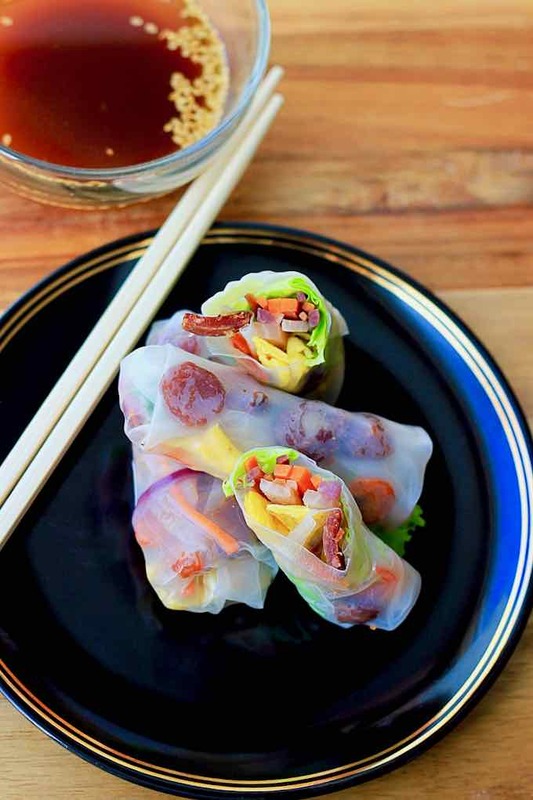 Bo bia spring rolls are the Vietnamese variant of Chinese popiah, introduced by the Teochew people who migrated to Vietnam and adapted using what was available in Vietnam. There are several significant differences that set bo bia apart from popiah. The biggest difference is bo bia is wrapped with rice paper while popiah is wrapped with wheat skin. Though both contain some similar ingredients such as jicama, egg and shrimp, other ingredients are not the same. Popiah is a Fujianese/Teochew-style fresh spring roll. Popiah is often eaten in the Fujian province of China (usually in Xiamen) and its neighboring Chaoshan (and by the Teochew and Hoklo diaspora in various regions throughout Southeast Asia) and in Taiwan (due to the heavy Hokkien influence), during the Qingming Festival. In the Chaoshan dialect, popiah means “thin wafer”. In varieties of Hokkien, it is also commonly referred to as lunpia (潤餅), which is the etymological origin of “lumpia” in Indonesia and the Philippines. 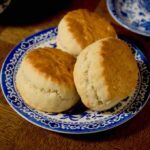 It is referred to as rùnbǐng or báobǐng in Mandarin, and also as bópíjuǎn . What is the difference between popiah and bo bia? There are several significant differences that set bo bia apart from popiah. The biggest difference is bo bia is wrapped with rice paper while popiah is wrapped with wheat skin. Traditional bò bía and popiah rolls, for example, use a thin sheet of dough as the wrapper. Popiahs feature more fillings and are accompanied by a different dipping sauce that’s less earthy and has more umami. Therefore, popiah stalls usually cut up their rolls into bite-size morsels like sushi to make them easier to eat. 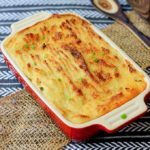 Though both contain some similar ingredients such as jicama, egg and shrimp, other ingredients differ. Jicama is a chubby root vegetable. It has a brown-yellow and papery skin and the inside is white and crunchy. This peculiar vegetable is best described as a cross between apple, radish and water chestnut. 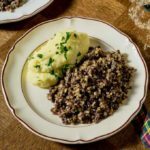 It can be eaten raw and is prized for its crisp, clean taste. It also remains crisp if cooked. Jicama can be used in spring rolls and salads and frequently appears in vegetarian meals. One of the most important components of bo bia is the dipping sauce. Like the broth in a good noodle soup, the dipping sauce can make or break a good bo bia. 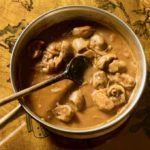 The dipping sauce should be made with hoisin sauce, plum sauce, minced garlic, and crushed roasted peanuts, chili paste, sugar, water and vegetable oil. It is very simple to make. In Taiwan, popiah is eaten in several varieties which can be classified into fried and non-fried versions. 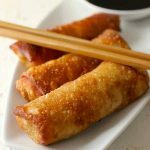 The fried spring roll version is very commonly served year-round in Chinese restaurants. It is small, crispy and rolled with meat or sweet red bean paste. The non-fried version is much more complicated and is called runbing, in Mandarin (still po̍h-piá in Taiwanese Hokkien). 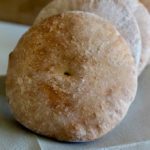 There are two kinds of skins which roll the stuffing: one that is slowly heated until cooked is famous for being very thin; the other is baked. Furthermore, the way of cooking the stuffing is very different as well. In northern Taiwan, the stuffing is flavored, stir-fired, sometimes it goes with peanut powder, and the sauce is salty. In southern Taiwan, the popiah stuffing is water blanched without additional seasoning, and flavored primarily with sugar and peanut powder. For people who live in southern Taiwan, the addition of sufficient sugar is key for popiah. Moreover, some people like to heat or steam the spring roll again after it is made. The stuffing itself is quite diverse among different places. The basic stuffing includes vegetables that grow in spring, meat and thinly shredded omelet. 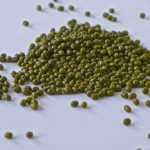 In some places, they also add noodles, Chinese sausages, stewed vegetables instead of blanched ones, tofu, seafood, sticky rice, and so on. In Malaysia and Singapore, popiah is part of Chinese cuisine of these two countries. In Vietnam, bò bía is the local variant of popiah, introduced by Teochew immigrants. It is common to see an old Teochew man or woman selling bò bía at their roadside stand. In Thai cuisine, two types are popular: popia sot (fresh spring roll) and popia thot (deep-fried spring roll). In addition, Thai cuisine has also incorporated the Vietnamese summer roll under the name kuaitiao lui suan. While in Myanmar, it is known as kawpyan. Similar foods in other cuisines include the Indonesian lumpia basah and the Filipino lumpiang sariwa spring rolls, etymologically derived from the Hokkien name lum pia. A majority of ethnic Chinese in both countries are of Hokkien origin. 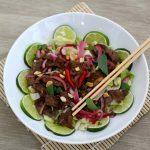 No need to travel all the way to Vietnam for a bite of these tasty morsels, when you can make these at home. I love the taste of the Thai basil in these spring rolls. It provides a lovely aroma and a sharp contrasting flavor. 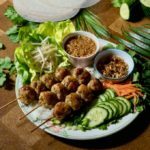 Some Vietnamese restaurants replace the Thai basil with lettuce as a cheaper alternative and as a way to make the rolls appear more voluminous. 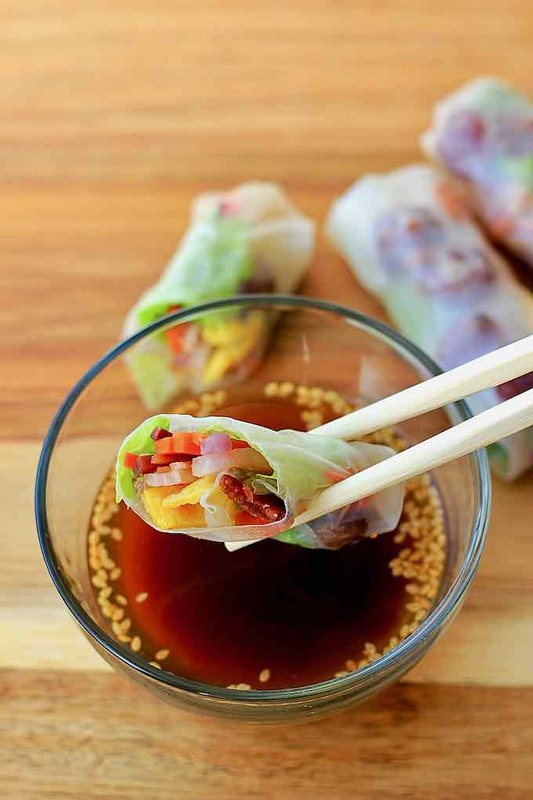 You can add lettuce to these spring rolls, but don’t exclude the Thai basil! It just doesn’t taste the same without them. Also, don’t exclude the dried shrimp. The toasted dried shrimp provides the bulk of the flavor. You can literally lure people to the kitchen from just the smell of the toasted dried shrimp. The umami smell of toasted dried shrimp, fried with shallots, is amazing. Bò bía is the Vietnamese variant of popiah, a very popular spring roll in Taiwan, Singapore, Malaysia, Thailand and Myanmar. Heat 3 tablespoons of oil in a wok over medium heat, then add the carrots and the jicama. Mix well and sauté for a minute. Add the fish sauce. Mix well. After 5 minutes, the vegetables will be cooked but still crisp. Set aside. In another wok, heat 2 tablespoons of oil over high heat and sauté the garlic clove for a few seconds, then lightly brown the dried shrimp. Set aside. In a frying pan, pour 1 tablespoon of oil and over very low, heat the sausages for 10 minutes. Finally, in a bowl, beat the two eggs, and season with salt and pepper. Heat 3 tablespoons oil in a pan and cook the eggs in a thin omelette. 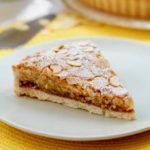 Cool and cut into large slices. Then prepare the sauce by mixing 1 tablespoon warm water and the hoisin sauce in a bowl. Sprinkle with golden sesame (or roasted peanuts). Set aside. Heat (without boiling) a large amount of water to moisten the rice paper wrappers. Pour this water into a large bowl. Dip a wrapper for 5 seconds in the hot water and gently place it flat on a cloth. Place the ingredients in the middle, towards the edge of the wrapper, starting with a small leave of lettuce, then the vegetables then the shrimps and 1 to 2 slices of omelette. Roll the wrapper by pressing on the ingredients. Before closing, place sausage slices to make them visible, fold the edges of the roll, and continue to roll to close it properly.